Number 6 is influenced by Venus. People of this number are very emotional and sincere. 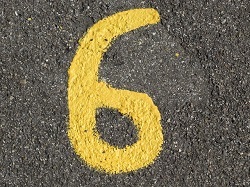 Those who were born on the 6th, 15th, and 24th day of any month have number 6 as their life path number. They are keen on everything aesthetical, and they are magnetized by everything attractive. Sometimes they are quite irrational, as their emotions took them over. However, it is hard to find people, who are as determined as number 6. Their negative feature is constant search for adventures that often hurts them. Number of a life path is most important number in your numerology chart. Numerology was varied between most cultures throughout periods of time. The Psycho matrix numerological system is absolutely new to the current century. Since the immemorial time people could feel the mysterious influence of numbers. With assistance of calculator you'll feel secure and will get the assurance in the future. The world is surrounded by a number of legends, beliefs, and myths. The Holy Christian Bible, or Biblia Sacra, remains the most popular book of all times.